Using the right oil can be the difference between an average and excellent massage. A good massage oil reduces friction, moisturises the skin and can even provide therapeutic benefits. 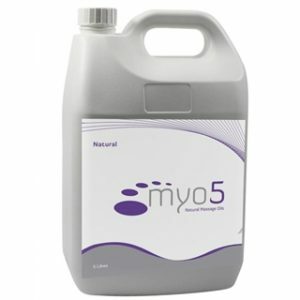 At Discover Massage Australia, we recommend MYO5 Natural Massage Oil, which is a natural pharmaceutical grade white oil with excellent soothing and moisturising qualities. It is light and easily absorbed, doesn’t stain and is non-allergenic, making it the perfect massage oil to use in your treatments. MYO5 Natural Massage oil comes ready to use or you can add your own blend of essential oils to it. The DMA store sells it in quantities as little as 500mls through to economical 5 litre containers. 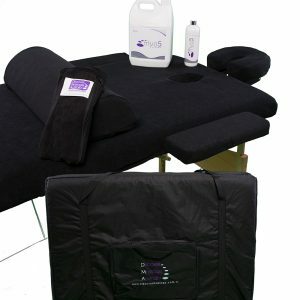 We also carry a range of therapist packs which contain not only oil, but everything else you could possibly need including table, towel, bolster, cover and bag. DMA is a recognised leader in massage training and the largest hands-on massage training college in Australia, producing thousands of graduates over the course of twenty years who have gone on to become successful therapists in their own right. With over 60 massage courses held around the country including Sydney, Melbourne, Adelaide, Brisbane, Canberra, Perth and the Gold Coast, there’s sure to be one near you. And all our courses are run by experienced therapists who want nothing more than to see you succeed, so the chances of achieving your full potential as a successful therapist are extremely high. Whatever your level of massage experience, we have training to complement your knowledge and ability. We provide courses for absolute beginners, catch-up training for those whose skills are a little rusty and advanced courses for experienced massage professionals wanting to learn advanced techniques related to specific injuries. So whether you’re a total novice or a practising professional, we can help you take your skills to the next level at Discover Massage Australia. Whether you need massage equipment to help with your training or you’re stocking up on your massage essentials, you’ll find everything you need in our DMA store. And if you’re thinking about taking a massage course soon, why not browse our website for details on the training we offer and when we’ll be coming to a city near you. But make sure you book online early, as places are limited and classes fill up fast.